W hen in August of 1914 public proclamations such as: “Your King and Country Need You! Will You Answer The Call?” were issued to Canadians, many families answered the call but at a great cost. They answered the call by sending their men and boys to fight the Great War. Proclamations containing enticements, advertisements and war propaganda created much fervor. War promised adventure and called out to the fantasies of children as young as 15. Caught up in the frenzy and excitement, many boys too young to enlist, lied about their age and went overseas to fight. Service men had to be at least nineteen years of age and older. However, sixteen year old boys could join the service with the written consent of their parents (Browne p.10). Many parents, not realizing the gravity of their decision at the time, willfully consented to sending their underage boys off to war. 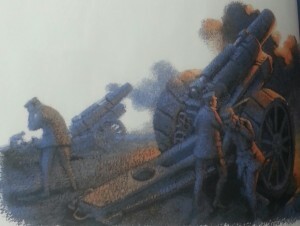 Debon’s illustration of a battle scene. Why did young men, aged 15, 16 and17 enlist in the military? Was it to sacrifice their lives in the name of pride, glory, or patriotism? According to World War One historian Gary Browne the answer may be that, they were more susceptible to propaganda and willing to take orders. He writes that, “They believed in their indestructibility and had a general incomprehension about risk or danger” (Browne p.14). Canadian men and their families were under the assumption that the war would end shortly. They assumed that the boys would be back home by Christmas the same year but their hopes were shattered because the war went on for many years and a great many lives were lost. Frantic letters and telegrams by parents to those in-charge, pleading for the safe return of their underage sons went unanswered because sadly, it was too late for many. On the 100th year anniversary of the Great War that started in 1914, the Children’s Library Archive at Ryerson University looks back to honor those who lost their lives in World War One. 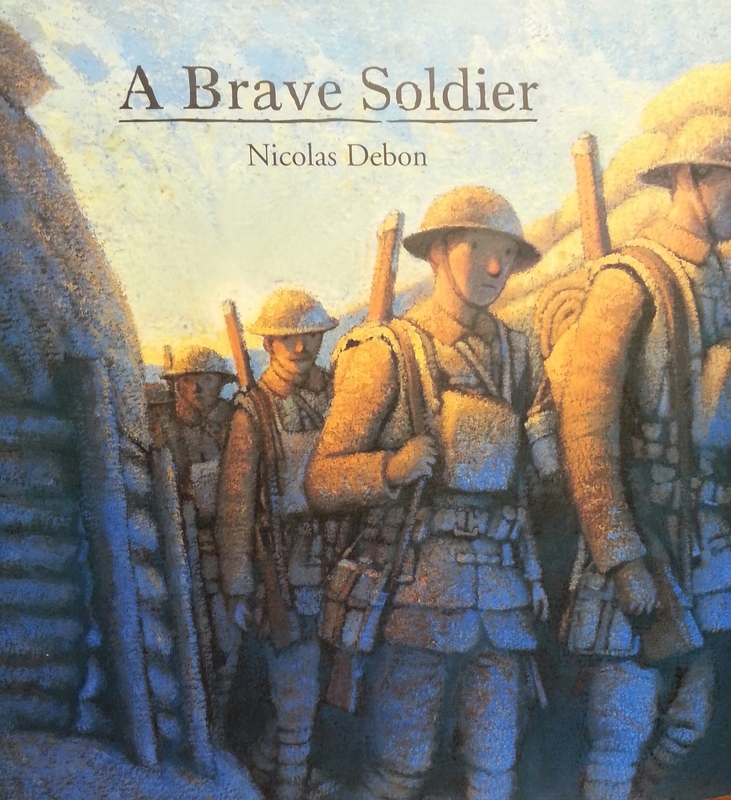 Housed in the CLA collection is Nicolas Debon’s A Brave Soldier. A beautiful book that narrates a tale of loss, separation, war and wisdom. Rooted in history, Debon‘s story is a fictional account of the journey of one brave young soldier named Frank. Debon narrates Frank’s journey to the front lines of the battlefield in France during the Great War era. Debon’s story is unique because it highlights the loss and disillusionment of warfare rather than the glory and victory that are usually associated with war in conventional war stories. 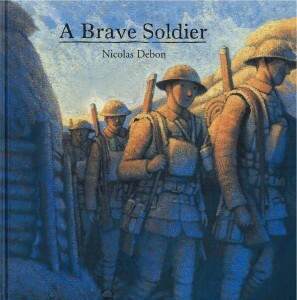 Written and illustrated by Nicolas Debon, A Brave Soldier is a work of fine art. Debon currently lives in France. He is a writer and an illustrator of immense talent. The English edition of this book is published by Groundwood Books, a Canadian company. Groundwood Books published A Brave Soldier in 2002 as part of a line-up of radical texts. Radical children’s texts contain a different message than conventional texts geared towards children. Rather than obedience and complacency, the message here is of critical thinking and questioning authority (Mickenberg & Nel). Debon’s illustrations are powerful yet subtle. The illustrations are congruent with the message that war is destructive. Illustrated using Winsor and Newton acrylics, the images are produced in a painterly style. A majority of the 34-pages that this hard-cover edition comprises of, consist of Debon’s fine illustrations. The images are an important part of this book, which is ideal for children as young as four and up. Even adult collectors of beautiful books would enjoy this piece in their personal libraries. Set in 1914, this is a story about Frank’s journey as a young soldier to the front line of battle and the wisdom that he acquires once there. A young Canadian boy named Frank joins the regimen with his older friend Michael. Without knowing anything about war, Frank enlists in the military. They travel to Europe by ship to fight alongside the British. Saying goodbye to his father, his mother, and his sweetheart, Frank embarks on a journey to no man’s land. However, Frank’s initial enthusiasm fades once he confronts the reality of war. He witnesses death, destruction, disease, and misery in the trenches. Frank is seriously injured and watches his friend Michael die on the battle ground. That moment changes his entire perspective. Needless to say, that this story does not have a happy-ending. 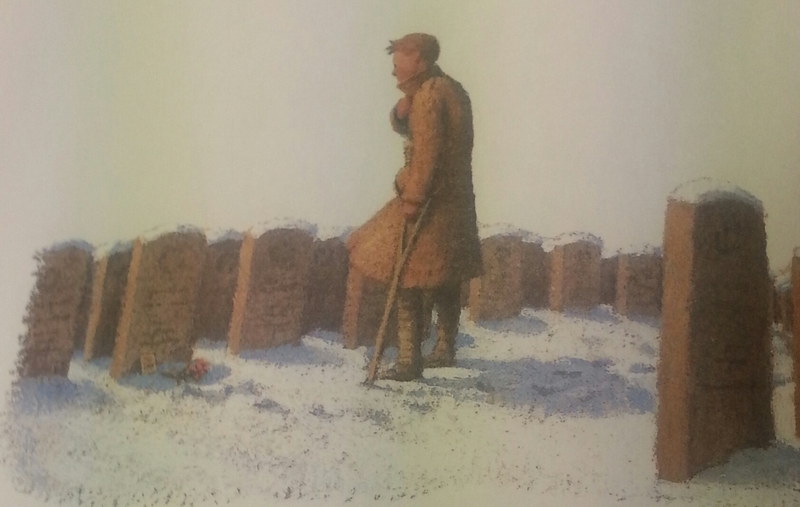 It is sombre and closes with Frank standing alone in a field full of the gravestones of the dead and buried soldiers, including his best friend Michael. In A Brave Soldier, Debon’s genius is manifested through a delicate storyline that contains a powerful latent message and is told in the most sensitive manner. Groundwood Books is an independent Canadian publisher operating in Toronto for the last 35 years. They produce texts of fiction, non-fiction and picture books for children and adults of all ages. Published by Groundwood Books Nicolas Debon’s A Brave Soldier follows a theme that their other publications for children tend to follow as well. Some scholars have called these “Radical Texts” (Mickenberg & Nel). Radical texts tend to be about war, poverty and social inequality. They emphasize the need to question authority and to speak up against injustice. Radical texts for children deal with complex social and political issues in a sensitive way, making it easier for children to understand historical, social and political material. Indeed, they deviate from the conventional lesson of obedience to authority that children are usually taught. Radical texts are coded with subversive messages that encourage children to speak up, ask questions and to think critically about the world that they live in. A Brave Soldier was well received by a number of reviewers. Canadian educational institutions were among those who appreciated the content and the context of Debon’s work. Reviewer Victoria Pennel writes that, historical fiction allows readers to “vicariously experience the past through a storyline” (Pennel p.5). It presents concepts that are sometimes hard for children to grasp such as war. 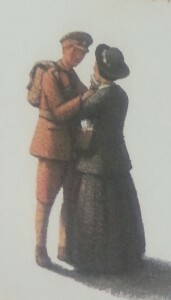 However, she argues that “historical fiction is generally a more interesting way for children and young students to learn history but in using this approach with students it is important to make them aware that the main aim of this genre is to tell a story and not to provide historical data” (Pennel p.5). At the same time, Pennel writes that Nicolas Debon’s A Brave Soldier is “sensitive” in its telling of the horrors of war (Pennel p.5). Other reviewers such as Hazel Rochman of The Booklist, an on-line forum of expert reviewers from the American Library Association, have praised A Brave Soldier for its poignant approach in depicting the futility of war. Reviewers generally agree that A Brave Soldier is an important text, and recommend that it should be used in school libraries for elementary school children across Canada. A Brave Soldier resembles the traditional structure of an adventure tale. The hero leaves ordinary human society in order to accomplish something great but he experiences disillusionment rather than glory in the battle field. From the beginning, to the middle and till the end, the narrative progresses sequentially from order to chaos, light to dark and from innocence to wisdom. The story strays from the conventional message of adventure tale because it depicts war as a tragedy. It does not promote the idea that war is fun, exciting, and necessary. Instead, it professes the view that, war equals destruction and those who choose war should question their own choices. A close reading of Debon’s text reveals that it contains a radical and rebellious message. It emphasizes the need to speak up against war. Coded within the structure of adventure tale is a tragedy that needs to be confronted. Michael dies at the end and Frank is injured physically and burdened emotionally. In this story as in real life, war equals heart-break. The storyline progresses from order to chaos. Beginning with the tranquility of home and family, it quickly progresses towards uncertainty of place, insecurity of life and ambiguity of purpose. This is a narrative of sacrifice. A brave soldier sacrifices everything and puts his life on the line. Of all the sacrifices though, the biggest and most ironic sacrifice seems to be of the soldier’s own personal freedom. Frank exercises his agency by enlisting in the military and by doing so, he willfully consents to forfeit his own freedom. After he enlists, we see that his personal freedom vanishes completely. As a soldier Frank is plucked from his hometown, shipped overseas, given orders to follow, provided a uniform to wear and placed on the front line of the battle ground. Ironically, in fighting for peace and freedom the soldiers give up that very thing, their own personal freedom. The plot revolves around the Great War and a young man’s journey from home and to the trenches. A boy is removed from his hometown in Canada, and placed in the war-zone in France only to end up in a graveyard. The two main characters are Frank and his older friend Michael. Frank survives while Michael dies at the end. Frank goes to the market. Some of the major themes found in A Brave Soldier are sacrifice, war, propaganda, ignorance and wisdom. The narrative also touches on the phenomenon of group-think mentality and the importance of independent thought. For example, when Frank goes to the market and sees the crowds gathered, it is then that his friend Michael influences him to enlist in the military. Both Michael and Frank follow the crowd and line up to enlist. Besides, their motives to go to war do not include patriotism. Both Frank and Michael join the war for superficial reasons, spawned by misinformation. Their decisions are based on the need for adventure, thrill-seeking and peer pressure. Michael is looking for an adventure and according to Debon, Frank knew nothing about war but did not want anyone to think that he was a coward. Their motives indicate the degree of their youth and innocence. Debon’s characters are not motivated by patriotism nor loyalty to the King. They are simply misinformed young boys who end up making the wrong choices. 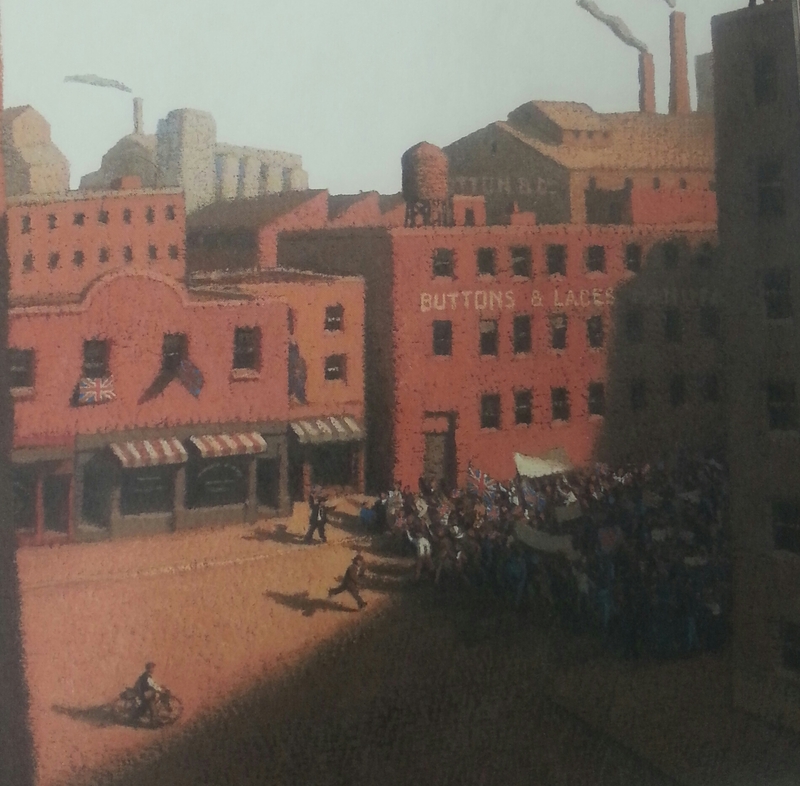 Debon’s painterly depictions of the narrative are remarkably beautiful and powerful in a subtle way. Using an analogous color scheme of earthy yellow subdued acrylics and complementary hues of blue, Debon captures both the innocence of the soldiers and the chaos of the war in a muted way. The faces are expressionless. There are no sharp edges. The images seem to melt and fade into one another. This creates the effect that the reader is viewing a recollection of faded memories. The illustrations are done with Winsor and Newton acrylics on cold pressed water-color paper. They are crucial to the story and add a visual layer of meaning that compliments the story. Debon’s illustrations for A Brave Soldier are rich with repetitions and motifs. At a closer look, we see that the image of the cross is present in almost every illustration. Crosses in the context of WWI signify the church, religion, the monarch and death. However, when the image of the cross is rotated slightly it represents something entirely different but very much within the context of Debon’s message. The cross rotated represents a negative, something crossed out, wrong, faulty, something to be removed. It is precisely the lesson that the protagonist learns, that war is wrong and must be avoided. As well, the expressionless faces depicted by Debon are intense in the effect that they create. They invite the reader to respond with empathy. By filling in the facial expressions through his/her imagination, the reader is more likely to relate to the characters on a personal level. Nicolas Debon’s book A Brave Soldier is a beautifully illustrated text with a highly thought provoking narrative. 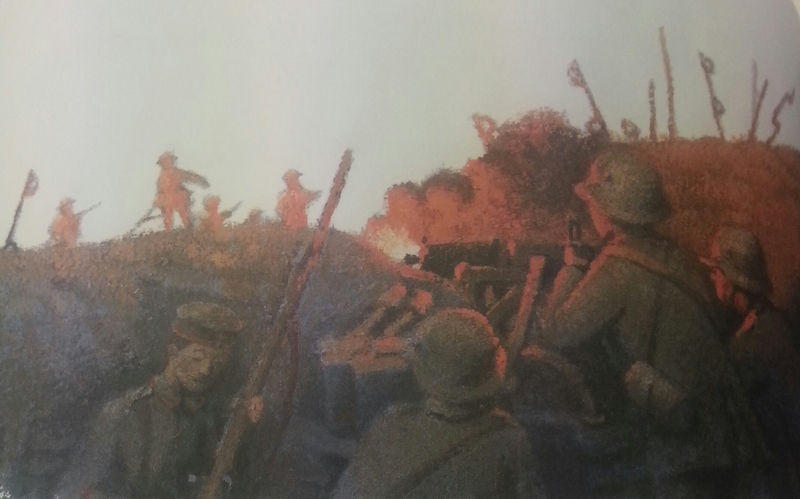 As a text of historical fiction for children, this book is a great tribute to the young brave soldiers of the Great War, on the 100th year anniversary of World War One. It gives voice to those Canadian soldiers who lost their lives, as well as, to those who survived and lived to tell about the horrors of war in the trenches. It does not glorify those deaths but rather poignantly and silently depicts the destruction of warfare, and the disillusionment felt by a soldier. This story gives the reader an opportunity to remember the war and its cruelty. While at the same time, it gives the reader an opportunity to pay respect to, and to meditate on, the great sacrifices made by the brave soldiers of World War One and their families. War is not glorious and nor is it an adventure but it is a reality. Although Frank and Michael enlist in the military by choice; however, societal pressure and war propaganda compel them to make that choice. Nicolas Debon’s A Brave Soldier shows how misinformation that associates war with adventure, and the fear of being called a coward; combined with, appeals to a population’s patriotism in the name of ideology, is the crudest form of war propaganda, and it guides individual behavior. Debon’s text is a critical look at war. It is an important text because it seeks to inform and to empower children. By educating children at an early age about the reality of war propaganda, as well as, about individual agency and the freedom to choose we may change the world and produce a future generation of peaceful critical thinkers. Barry, Peter. Beginning Theory . Manchester, U.K: Manchester University Press, 2009. Print. Browne, Gary F. Forget-me-not: fallen boy soldiers. St. John’s, Newfounland and Labrador: DRC Publishing, 2010. Print. Canada. Canadian Hertitage and Canadian Meuseum of Civilization Corporation. War Meuseum.ca: Canada and the First World War. Web. 10 02 2014. <http://www.warmuseum.ca/cwm/exhibitions/guerre/home-e.aspx>. Debon, Nicolas. A Brave Soldier. Toronto: Groundwood Books, 2002. Print. Fisher, Susan L. Boys and Girls in No Man’s Land. Toronto: University of Toronto Press, 2011. Print. Mickenberg, Julia L. and Philip Nel. “Radical Children’s Literature Now!” Children’s Literature Association Quarterly 36.4 (2011): 445-473. Web. Pennel, Victoria. “Exploring our heritage: An overview of recent Canadian historical fiction for children and young adults.” School Libraries in Canada 22.3 (2003): 5-11. Web. Rochman, Hazel. 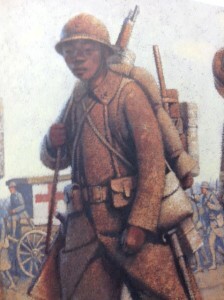 “A Brave Soldier by Nicolas Debon.” Rev. of A Brave Soldier, by Nicolas Debon. The Booklist (2002): 491. Web. Royde-Smith, Johm Graham. “World War I (1914-18).” Encyclopedia Britannica. Web. 22 02 2014. <http://www.britannica.com/EBchecked/topic/648646/World-War-I>.